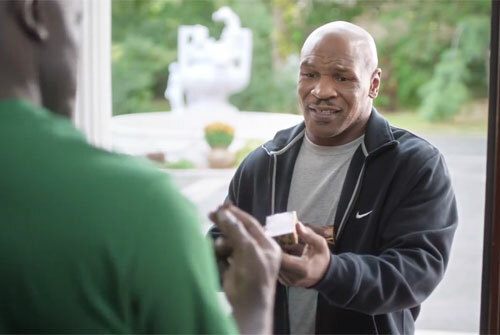 In a new ad released by Footlocker on November 20, an apologetic Mike Tyson shows up at Evander Holyfield’s, doorstep asking for forgiveness by handing back his old adversary’s ear. The two ex heavyweight boxers hug it out in the newly released commercial titled “All Is Right,” which fantasizes about Tyson and Holyfield finally making up over the infamous ear biting incident in June 1997 at the WBA fight at the MGM Grand in Las Vegas. Photo shows Mike Tyson returning Evander Holyfield’s bitten ear in an hilarious Foot Locker commercial titled “All is Right,” in an ad which fantasizes about a perfect world. The commercial also spoofs former NBA star Dennis Rodman asking for a one-way ticket to North Korea and former Green Bay Packers quarterback, Brett Favre, learning a lesson about knowing when to walk away. The June 28, 1997 Evander Holyfield vs. Mike Tyson II fight was billed as “The Sound and the Fury” for the WBA Heavyweight Championship. The fight took place at the MGM Grand Garden Arena in Las Vegas, Nevada. The referee officiating the fight was Mills Lane, who was brought in as a late replacement when Tyson’s camp protested the original selection of Mitch Halpern (who officiated the first fight) as the referee. Photo shows Mike Tyson biting Evander Holyfield’s ear in the June 1997 WBA Heavyweight championship fight fight held at the MGM in Las Vegas. According to Wikipedia, as the third round was about to begin, Tyson came out of his corner without his mouthpiece. Lane ordered Tyson back to his corner to insert it. Tyson inserted his mouthpiece, got back into position and the match resumed. Tyson began the third round with a furious attack. With forty seconds remaining in the round Holyfield got Tyson in a clinch, and Tyson rolled his head above Holyfield’s shoulder and bit Holyfield on his right ear, avulsing a one-inch piece of cartilage from the top of the ear, and spitting out the piece of ear on the ring floor. As Holyfield shrieked in pain and jumped in circles, he managed to push Tyson away at which Lane called for a time-out. As Holyfield turned to walk to his corner, Tyson shoved him from behind. Lane sent Tyson to a neutral corner as an Holyfield gestured for Mills Lane to look at his bitten ear which was rapidly bleeding. The fight was delayed for several minutes as Lane debated what to do. Lane’s original decision was to immediately disqualify Tyson, but after the ringside doctor determined that Holyfield was able to continue despite the massive bite, Lane announced he would be deducting two points from Tyson and the fight would continue. During another clinch, Tyson bit Holyfield’s left ear. Holyfield threw his hands around to get out of the clinch and jumped back. Tyson’s second bite just scarred Holyfield’s ear. Lane did not stop the fight this time, so the two men continued fighting until time expired. The men walked back to their respective corners when the second bite was discovered and the fight was then stopped. As a result of biting Holyfield on both ears and other behavior, Tyson’s boxing license was revoked by the Nevada State Athletic Commission and he was fined USD $3 million plus legal costs. The revocation was not permanent; a little more than a year later on October 18, 1998, the commission voted 4–1 to restore Tyson’s boxing license. One of Tyson’s former trainers, Teddy Atlas, predicted before the fight that Tyson, unable to cope with fighting a man whom he could not intimidate, would deliberately get himself disqualified. In the 2008 documentary Tyson, the boxer claimed he did it as retaliation for the headbutting. On October 16, 2009 on the The Oprah Winfrey Show Tyson apologized to Holyfield where Holyfield accepted his apology and forgave Tyson. Sports Speakers 360 is a sports talent agency for booking athletes. If you would like to book famous athletes like Mike Tyson, Evander Holyfield, Dennis Rodman or Brett Favre for a speaking engagement, autograph signing, VIP meet and greet, persoanl appearance, product endorsement, social media campaign or special corporate event, you can contact the athlete’s booking agent for speaking & appearance fees or call 1.855.303.5450.